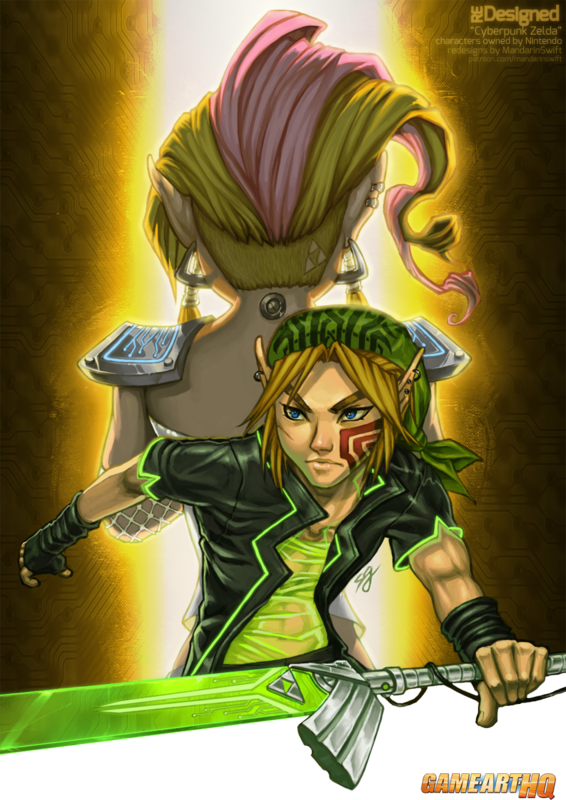 Cyberpunk Link and Zelda by Game-Art-HQ Contributor Mandarin-Swift! Cyberpunk is something I felt in love with back in the early nineties already when there was this super cool Shadowrun game for the Super Nintendo and I got in touch with the Shadowrun novels a bit later. I am still buying some of these from time to time and hope to get the whole lineup together. MandarinSwift now a GA-HQ Patron and one of our active contributors drew Link and Princess Zelda and redesigned themCyberpunk Style. Link might not be the tallest and most muscular guy but I could totally imagine him as a Street-Samurai while Zelda could be good with all the hacking stuff and breaking some Megacorps Ice as a skilled decker. DREK! ps: MandarinSwift also participated in our upcoming Nintendo 64 Art Tribute with her take on Castlevania: Legacy of Darkness! You can see her submission and many other artworks in her gallery on deviantART!